Brighton has taken everything you've been looking for in a starter greenhouse and put it in one ultimate unit - although available in two sizes (6x4 and 6x8). From the 4mm thick twin-wall poly panels to the sturdy aluminum frame. It's all there. The twin-wall panels bring out the life of your greenhouse with a fantastic blend of thickness for good insulation while allowing just the right amount of light to enter. The opaque roof and walls breaks up any direct rays that may be damaging to your plants. This unique combination allows the perfect amount of sunlight to enter your greenhouse without harming your plants. The Brighton comes with galvanized steel base kit (included FREE) and an aluminum frame which is noticeably thicker and stronger than other similarly priced greenhouses. Another feature of the Brighton which sets it apart from other starter kits is the height, both overall and door height. The Brighton stands at 7' 5" tall and has a door height of 6' 5", which is very tall for the price and gives plenty of room for nearly everyone. The greenhouse as stated above comes in two sizes 6x4 and 6x8 currently, although the manufacturer has stated to us that larger sizes may be coming soon if the demand is there. The units are finished off with a roof vent and rain gutter kits allowing you to put to use outside elements in your greenhouse. Brighton offer a sensible selection of greenhouse accessories which are inexpensive and will add to the functionality of your greenhouse. Assembly is fairly easy and can be completed in 4-6 hours with two people. It also arrives in a few, easy to manage boxes so you won't be unloading a heavy pallet from your driveway. The Brighton comes with a 5 year limited warranty. That, along with its functionality, aesthetic value, and durability easily makes the Brighton Hybrid our #4 choice for a greenhouse. You won't be disappointed. Featuring 4mm twin-wall polycarbonate panels, 7' 5" peak height, 6' 5" door height, and free base kit! The Brighton 6'x8' Greenhouse features the same rigid frame with opaque twin-wall polycarbonate panels as the 6'x4' model but with double the growing space. The Brighton 4mm panels balance sun exposure throughout the day and offer a good combination of insulation with plenty of diffuse light transmission. The larger size gives plenty of elbow room and at nearly 7.5' tall with a door height of nearly 6.5' even the tallest gardeners will have plenty of headroom! The Brighton 6'x8' includes a heavy-duty steel base kit, rain gutters with downspouts, and 2 roof vents for ventilation. Our all-in-one philosophy makes using a Brighton greenhouse easier than ever before. 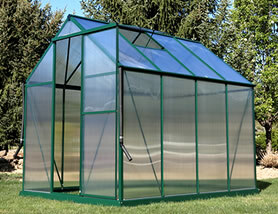 We include everything you will need have your greenhouse set up in just a few hours. Backed by more than 40 years of greenhouse manufacturing technology, our greenhouses have what it takes to build the garden of your dreams. Building a Brighton greenhouse is a snap - literally. The pieces are constructed for an easy setup, and don't require cutting like other wood-frame and aluminum-frame greenhouses on the market. Instructions are clear and well-thought out, and can be easily followed. • Vent window included for air circulation to balance humidity and temperatures.